Destiny’s world and story are build around some of the deepest, most epic video game lore this side of Dark Souls. And much like From Software’s brutal, RPG masterpiece, Destiny trusts you to piece a lot of it together yourself. 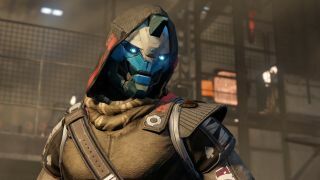 Although Destiny 2 is now making a lot of things a great deal more explicit, between story threads yet to be picked up, concepts buried deep in the game’s backstory, and a whole raft of oblique teases and hints at things to come, there’s still a lot to know if you’re going to stitch the game’s many references together in order to see the bigger picture. Spoiler warning: Although most of this article covers big-picture lore and world details, one or two spoilers for Destiny 2's campaign are unavoidable, as well as some broad details from the first game. Guardians - The reanimated corpses of the ancient dead, resurrected without memories of their previous lives to be (mostly) immortal warriors, created to protect the remnants of Humanity against all manner of intergalactic threats. The Traveler - A giant, pseudo-magic space golfball of unknown origin that arrived in our solar system some unknown number of centuries ago. It brought the gift of Light, which elevated Humanity to the Golden Age. Though we are not the first civilisation to be visited in this way. The Traveler has been doing this, across the universe, for longer than anyone knows. The Darkness - A currently abstract entity of apparent malice (though the jury is out over whether this is a truly black-and-white situation). Also some manner of cosmic force, and a place outside of our reality. The Darkness is the Traveler’s age-old enemy, and has been pursuing it for countless millennia. Whenever it catches up, calamity and war ensue. In fact there’s a theory that the Traveler only ascends civilisations in the first place in order to raise armies that can defend it against its nemesis. The Collapse - The period when the Darkness arrived at Earth, smashing Traveler and Humanity alike. The majority of the population died, civilisation collapsed, and whole worlds lost contact with each other. The exact details are lost to history, but the fragments we do have are thoroughly apocalyptic and rather nightmarish. Golden Age advancements became lost relics, and we’ve been picking up the pieces ever since. The Speaker - The human representative of the (silent) Traveler’s will. Head of the Guardian forces, and chief proponent of the grand mission of ‘Light good, Darkness bad’. Long suspected by some players to be somewhat of a charlatan, a theory confirmed in Destiny 2. Ghosts - Sentient, flying pocket-robots, created by the Traveler during Earth’s defeat in the Collapse as a last-ditch attempt to continue the fight. Ghosts travel the world, looking for the right corpse to resurrect into a Guardian, who they then bond with forever. The City - The last city left on Earth, home to Guardians and ‘normal people’ alike. Following the Collapse, whatever was left of Humanity consolidated in a single city located directly below the dormant Traveler. If we lose the City, well, that’s everything gone. Its exact location isn’t known, but based on the geography of the first game, it’s certainly somewhere within what used to be Russia. The Tower - The home of the Vanguard, the organisation of Guardians that watches over the City. Headed up by three Vanguard leaders, each affiliated with a particular class of Guardian, who in turn traditionally report to the Speaker. The European Dead Zone - A previously lost part of Europe, located in what used to be Germany. Long an isolated wilderness, visited by the Vanguard only for Crucible matches, it’s now a major patrol area and is starting to be reclaimed. Warlock - A Guardian class. Warlocks are something between a mad scientist and a wizard, concerned with the arcane mysteries of the universe, and learning means to harness them for empowerment. Often slightly feared by non-Warlocks for their experimental, borderline-occult ways. Ikora Rey is their Vanguard leader. Hunter - A Guardian class. Hunters are the rangers of the group, keen scouts and explorers with a frontier spirit and an adept, fast-flowing, almost gymnastic talent for combat. Cayde-6 is their Vanguard leader. Titan - A Guardian class. Titans are the physical heavy-hitters, in contrast with the arcane, raw, magical power of Warlocks and the gun-slinging speed of Hunters. That said, Titans are also strong protectors, willing to leap straight into the breach in order to protect their allies. Zavalla is their Vanguard leader. The Crucible - The Guardians’ training ground, organised and supervised by Lord Shaxx. Though while officially a Vanguard exercise, it has now also evolved into a form of entertainment for the people of the City. This is where PvP combat takes place, in locations across the solar system secured and approved by Shaxx for training purposes. Void - One of three energy types harnessed by Guardians in their special combat and support powers, which also adds a damage modifier to certain weapons. Otherwise known as ‘the purple one’. Used by all Guardians, but most closely associated - in terms of lore, at least - with Warlocks. The Void itself is a realm of negative space that exists outside of our reality, but potentially connects us to many other places, and has ambiguous parallels with the Darkness. It’s a place of incredible power, but can also be addictive and corrupting. Like I said, Warlocks love it. Arc - The second type of energy used by Guardians and weaponry, this one is pulled from our plane of reality, being the product of harnessing the electricity that exists in all of life. It is the blue-flavoured energy. Solar - The third type of energy, and another one with its origin in our immediate world. Solar energy comes from harnessing the power of the sun. Or rather, suns. Any living star in any timeline can be drawn upon by Solar energy users, and the results tend to burn bright. Solar powers and gear are identified with yellow icons.